There is nothing quite like home-baked mince pies – it really is worth making your own pastry for this and they smell wonderful. Makes 12 regular sized pies or 24 mini-pies. Jar of mincemeat – from the shops or home made! Make your pastry Rub the fat and flour together by pinching through your fingers and thumb as lightly as you can, until the mixture looks like breadcrumbs; then add a little water and form into a ball. Or, if you have a food processor, whiz fat and flour in that, then add water. Roll the pastry out fairly thinly (about 2 to 3mm) on a work surface. 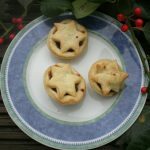 For regular mince pies, cut out 12 rounds approx 8cm diameter for the mince pie bottoms and 12 approx 6 cm for the tops, For mini mince pies, cut 24 rounds approx 6.5 cm for the bottoms and 24 little stars for the tops. Pop the bottoms into the muffin tins. Spoon in 2 teaspoons approx of mincemeat for regular pies (don’t fill too full) or 1 teaspoon for min pies. Put on the lids – for regular lids you’ll need to cut two slits for the steam to escape, but you won’t need to do this if using stars. Bake in preheated oven at 200°C, gas mark 6, for about 15 mins until golden brown. Lift them gently out of the tray onto a cooling rack while still warm – they will be difficult to handle once cold.